It seems that the Apache Cassandra Column Store can compress the columns pretty good – factor 10 less disk space! The source table in PostgreSQL (TimescaleDB) with a timestamp and a key column and 8 data columns had about 170 Mio rows. I needed to flatten the table so that i have just the timestamp as primary key and many columns and each column is of a type. It ends up in a table with about 1.6 Mio rows and many columns. Apache Cassandra wide column store table with ts as primary key and many columns. With WinCC OA Java (https://github.com/vogler75/oa4j) we can stream data from WinCC OA to Apache Kafka, use KSQL to produce some insights and send it back to WinCC OA by using a WinCC OA Driver written in Java connected to Kafka. Attached you will find a docker-compose.yml to setup KSQL + WinCC OA Connector and Driver to test it. Just use “docker-compose up -d” to start up everything. Before you should set the “data” and “event” environment variables in the docker-compose.yml to point to a running WinCC OA project. 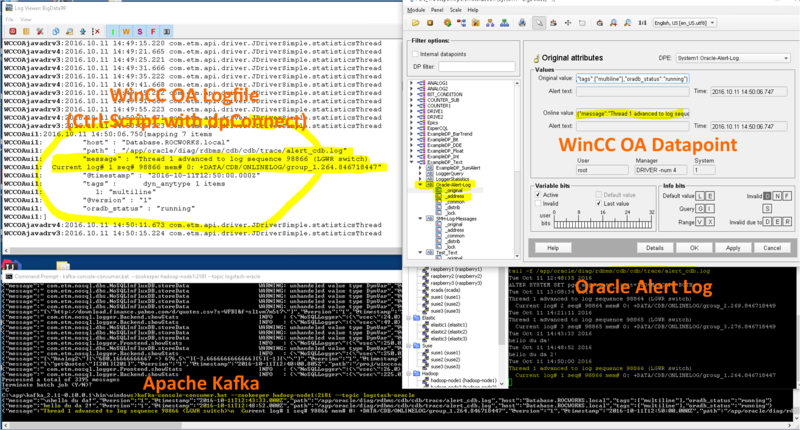 Creating winccoa_driver-kafka_1 ==> OA driver to read data from kafka. We use Docker to startup WinCCOA Mangers (frontend, backend) and Drivers. In WinCC OA you should put a peripheral address on a datapoint with the example driver (num 4) to get the result back (you will need the panels and scripts from here https://github.com/vogler75/oa4j/tree/master/Project/Drivers/Kafka to use the driver). For example we do this with the Oracle Alert Log. Very often an Oracle Database is used with WinCC OA to store history values. But a lot of times no one takes care of the Oracle database. At least the Alert-Log file should be observed. 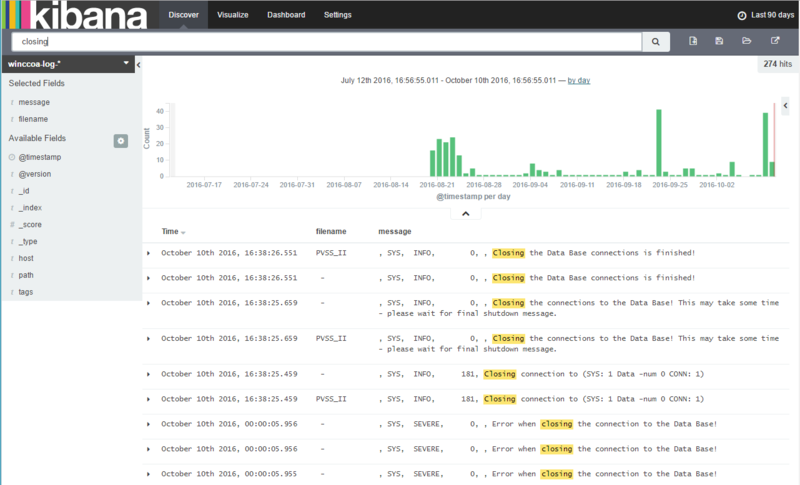 With Logstash, Apache Kafka and the WinCC OA Apache Kafka Driver we can send alert log messages from the Oracle database(s) to a WinCC OA monitoring system. A WinCC OA Driver to connect WinCC OA to Apache Kafka (input & output). Keep in Mind: It is not a comparison of the databases only. With Oracle we used the WinCC OA RDB Manager with OA Query-RDB Direct option, and the RDB-Manager has lot of more functionalities than the NoSQL Prototyp! The other databases were tested with a NoSQL Logger Prototyp written in Java, and the implementations for writing and reading are different, because there are different interfaces for each database – for PostgreSQL we used the PostgreSQL JDBC driver, MongoDB has it’s own Java API and InfluxDB uses REST/HTTP. So, not only the speed of the database itself is compared – also the interfaces to WinCC OA and the implementations of reading are taken into account. it is faster than MongoDB. And our InfluxDB is running on a MacMini (Hyper-V) and the data is stored on a shared Synology NAS for home usage (DS414 slim) – much less power for InfluxDB compared to the four 7.2k disks and to the i7 where the Oracle DB and MonogDB is running on. PostgreSQL is running on the same machine and disks as Oracle and MongoDB. Complex Event Processing (CEP) and event series analysis are used for detecting situations among events. EsperTech provides the Event Processing Language (EPL) designed for concisely expressing situations and fast execution against both historical and currently-arriving events (Espertech.com). The Esper EPL is quite powerful – details can be found in the Esper documentation. Found also some slides about Esper. 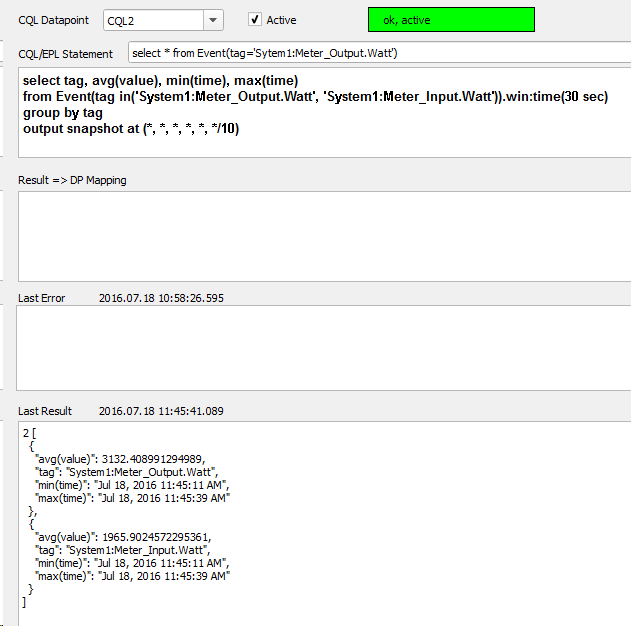 The EPL is a CQL (continuous query language), after a statement is created it is running coninously and results are streamed to listeners – in this prototype a listener is sending the results back to WinCC OA datapoints. A WinCCOA API-Frontend-Manager gathers all value changes from WinCC OA and publishes it by ZeroMQ. The WinCC OA CEP Manager, with the open source Esper-Engine, subscribes to the Frontend-Manager to get the value changes. The advantage is that many subscribers can be connected to the Frontend-Manager, without increasing the load on the WinCC OA system (based on the ideas from CERN). With the WinCC OA CEP Manager we can define EPL / CQL statements in WinCC OA and the result streams are passed back to WinCC OA on datapoints, where the results can be processed further. With pattern matching complex event sequences can be observed with EPL. A simple example is: detect if datapoint B is set after datapoint A (A->B), and its value is higher than the value of A. Other examples can be found here. Attached is a screenshot of a simple panel where EPL statements can be defined and observed. 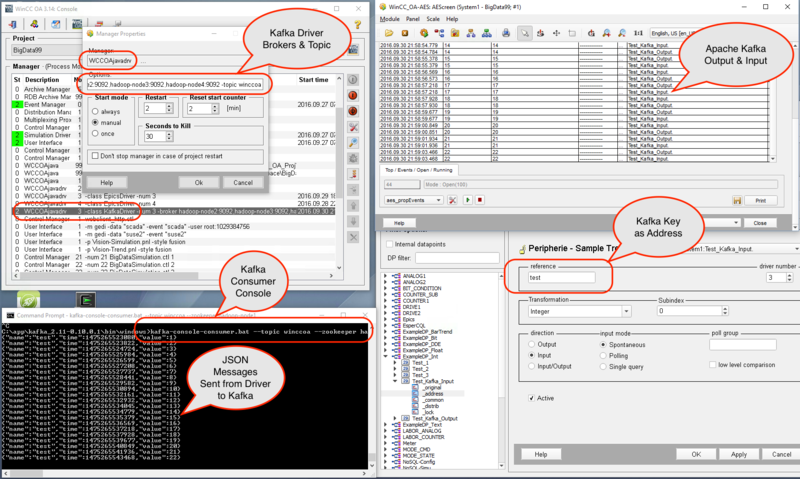 We connected a Event Data Logger, written in Java and connected to WinCC OA by JNI, to Apache Kafka, a A high-throughput distributed messaging system. 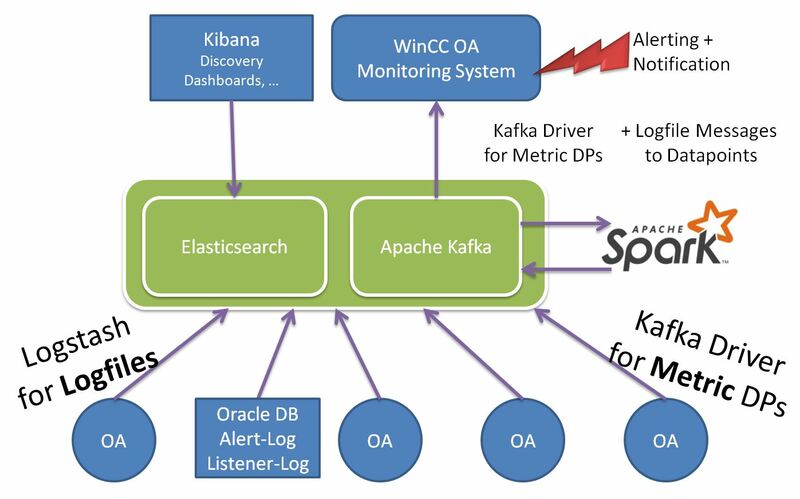 Apache Spark can read data from Apache Kafka streams. Apache Spark is a fast and general engine for large-scale data processing. Combine SQL, streaming, and complex analytics. 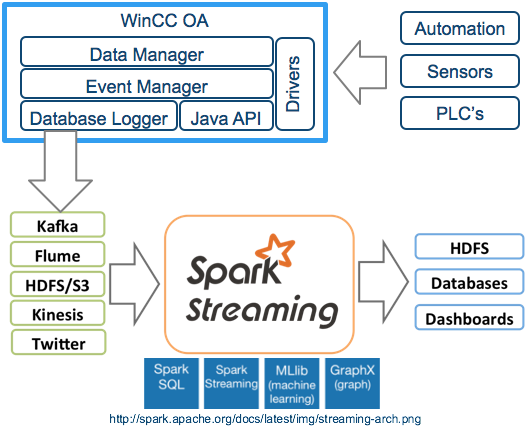 Spark powers a stack of libraries including SQL and DataFrames, MLlib for machine learning, GraphX, and Spark Streaming. You can combine these libraries seamlessly in the same application. From laptops to datacenters, game consoles to scientific supercomputers, cell phones to the Internet, Java is everywhere! Now connected to WinCC OA. Here you will find an implementation of an API to connect WinCC OA to Java. It is based on the WinCC OA native API and JNI. This version is for WinCC OA 3.14 on Windows. Same works on Linux, but is not in the Zip, if you want it for Linux, just send me an email. An example for a dpSet in Java see blow, more examples are in the zip/source directory. The JClient class is an easy to use static class. It should be thread safe and callback functions are processed in a separate thread, so that the main WinCC OA thread/loop will not be blocked by callback functions. Based on that a NoSQL database logger was created, it is able to handle up to 40000-50000 value changes by dpQueryConnect. 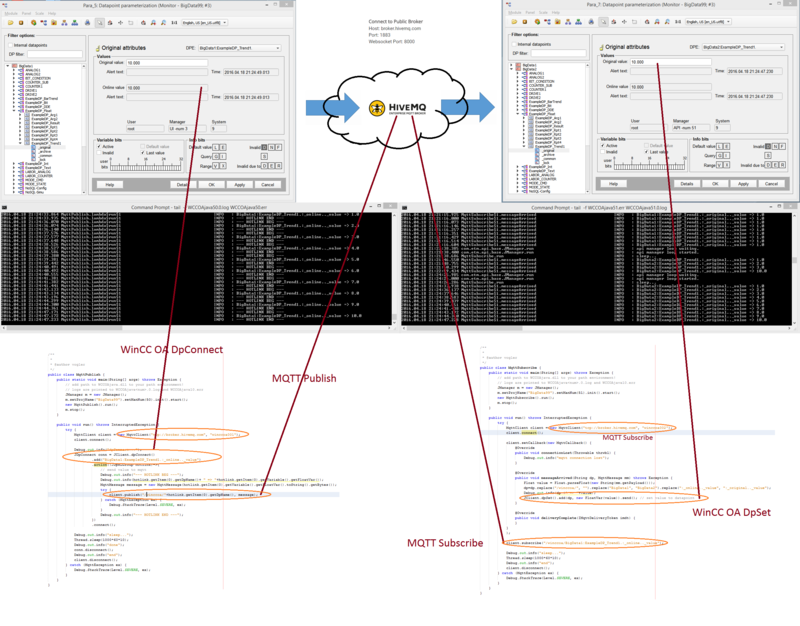 MQTT was connected to WinCC OA with a few lines of code (see WinCC OA and MQTT). How to use/install? In the zip is a ReadMe.txt with a step by step instruction. Recently i implemented a JAVA API for WinCC Open Architecture. So, it is possible to implement WinCC OA API Manager in Java. I used this to implement a simple API Manager in Java to connect WinCC OA to MQTT. MQTT is a machine-to-machine (M2M) “Internet of Things” connectivity protocol. It was designed as an extremely lightweight publish/subscribe messaging transport. It is useful for connections with remote locations where a small code footprint is required and/or network bandwidth is at a premium (http://mqtt.org/). Machine Learning for Sensor Prediction…. Siemens IoT2000 and WinCC OA….